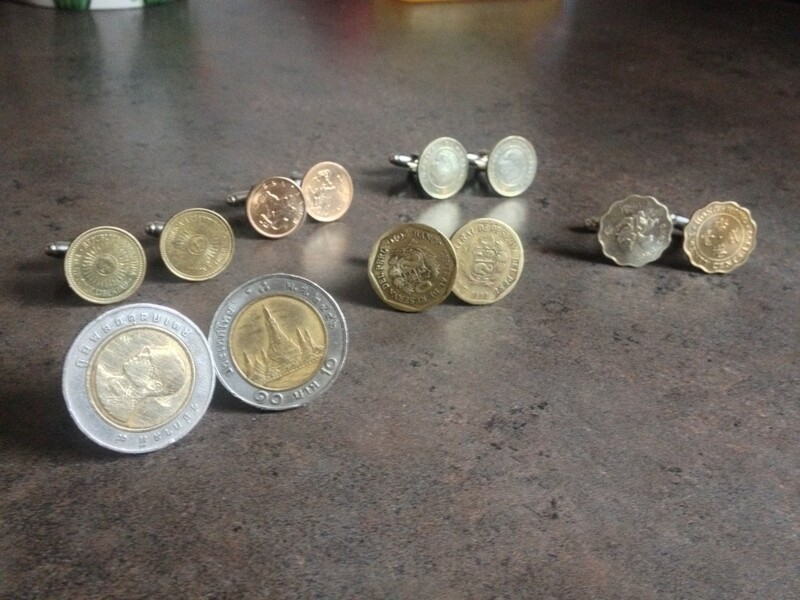 I believe the adage goes, "When life gives you pocketfuls of foreign currency, turn them into cufflinks to go with that suit you bought for your friends' wedding this summer." After hitting 18 countries in 2013 I returned home with about 5lbs of coins and no certainty as to what I should do with them. I could go to the bank and cash them in... For maybe $10? For that much I'd rather keep them around as mementos. But one should always be wary of mementos measured in pounds. Fortunately this problem happened to coincide with another: I recently bought a suit for a wedding — and just generally for life, because who doesn't look good in a suit? — this summer that necessitated cufflinks. I didn't really want to borrow cufflinks, and after spending about 40 minutes looking online I knew I either wanted to buy zero or about fifty and start a collection. So I did what I do in far too many situations: looked at the thing and decided "How hard can that really be? I'll just make my own!" As it turns out, cufflink blanks are not just two words I put together, but something I could actually buy. Behold the wonder that is Amazon and dangerously low profit margins! It seems fate would shine kindly on my propensity for trying to make things I probably shouldn't, my irrational frugality in not wanting to purchase cufflinks to go with my new suit and my selective, slightly unintentional international hoarding habit. I was a little sad my coins from Iceland and Kenya didn't survive. I mailed them back at one point along with some gifts during the trip, but the package was opened up and all the coins, along with most of the gifts, were stolen. Look for my future post on quitting web development and opening a full-time Etsy shop.